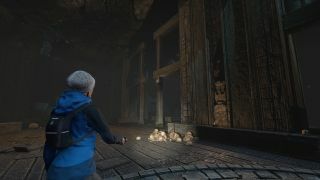 Free demo promises fear that “stems from somewhere deep”. Third-person survival horror game Through the Woods is the debut venture from Norwegian studio Antagonist that’s out later this year. Viewed through the eyes of a mother who’s lost her son, it guides players through a seemingly haunted forest and is designed to play on a childlike fear of the dark and the unknown. Successfully crowdfunded last year, Through the Woods' horror at first leant toward the psychological variety, however has since shifted slightly towards a purposely fantastic interpretation of terror, but one which is rooted in more tangible experience. “A common characteristic of psychological horror is that you begin to blur the line between what is real and what is not,” the game’s writer Dan Wakefield tells me. “Perhaps you start to imply subtly that the character is a little unstable or maybe that certain events are not really happening. You run the danger of the 'is it all in their head?' feeling. Much of that impossibility is tied to the game’s mythical creatures, such as towering trolls which occasionally stalk the player, while its narrative is analogous with Norse mythology and folklore. Anyone familiar with the artist Theodor Kittelsen might have some sense of what to expect, says Wakefield, however Antagonist has put its own “twisted and corrupt” spin on its visuals. Over the past year and half, the scope of Through the Woods has changed considerably too—what was at first to be a three hour game now stretches to around six. It’s expanding, then, a fact echoed by the lengths Antagonist has went to in order to portray a believably frightening world. “One thing that's definitely been very rewarding is that all of our art and sound effects have been captured in Sognsvann, a genuine Norwegian forest 20 minutes from our office in Oslo. We've been there a few times to take photos of textures, to capture wind, trees, water, etc and we filmed our Kickstarter video there as well. Through the Woods is looking at a “mid-September to early October” launch, says Wakefield. Until then, you can check out the free demo that featured at PAX 2016 by heading this way.